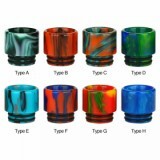 These 8 typs resin drip tips are designed for the VOOPOO UFORCE T2 Tank. They'll make your tank unique than others. Resin Drip Tip for 810/ VOOPOO UFORCE T2 is made of high quality resin material and perfectly compatible with most 810 atomizers especially for VOOPOO UFORCE T2. Just get this drip tip for your atomizers to enjoy pure flavor. Attractive colors for your selection. • It is for most 810 atomizers, VOOPOO Drag 2 Kit with UFORCE T2 and VOOPOO Drag Mini 117W TC Kit with UFORCE T2.